Designed with a flat-bottomed head that allows it to standup and rock enticingly on the bottom and prevent snags, features an easy-to-rig screw lock to firmly secure your bait. 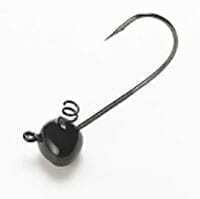 Also a 60 degree Gamakatsu hook, powder coated and baked for durability. Our staff is looking forward to talking about our experience with the Shakey Head jig, how it differs from other jig heads and the best way to fish it. Buy online, stop in the store or give us a call at 973-835-2966.